Several news agencies have recently focused their attention and climate change reports on the apparent lack of global surface warming since 1998 and whether the simulated temperature changes are too warm. This period has been described as a ‘slow-down’, ‘pause’ or ‘hiatus’, with hiatus receiving the most support in the press. The focus of many of these news articles has been the sensitivity of climate models. If there is a real hiatus in warming temperatures over the past decade, then what has caused it and does it question the confidence in climate models to accurately forecast how the climate will change during the next 10-30 years? There are several options why the climate simulations may appear too warm. The three most likely include: i) aerosol emissions have not declined as rapidly as assumed due to improved environmental regulation; ii) no volcanic eruptions have been included in the post 2005 simulations or; iii) solar activity post-2005 has been weaker than the simulations assume. The final possible explanation is that internal climate variability has reduced the rate of warming this decade, and that some of the additional energy may be in the deep ocean instead of the atmosphere. 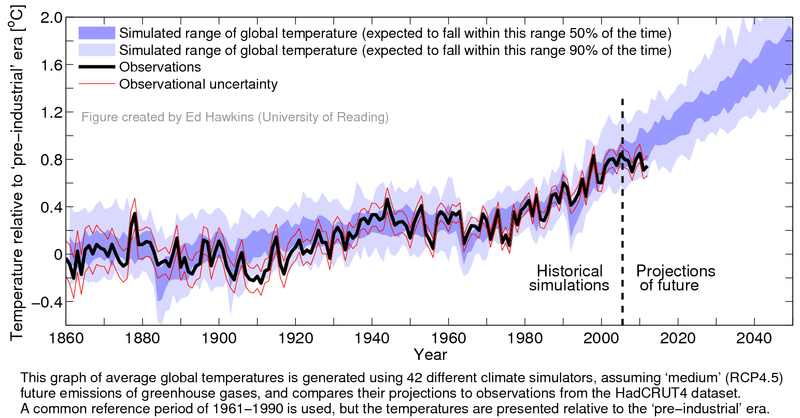 A figure developed by Dr Ed Hawkins which includes the observed temperature record from 1850 to present and the range of 42 model simulations projecting global temperatures to 2050 has been presented as evidence in the U.S. Senate and more recently on the BBC news in the lead up to the latest IPCC 5th Assessment report to be released on Friday 27th September. Comparing observations and simulations of global mean surface temperature.